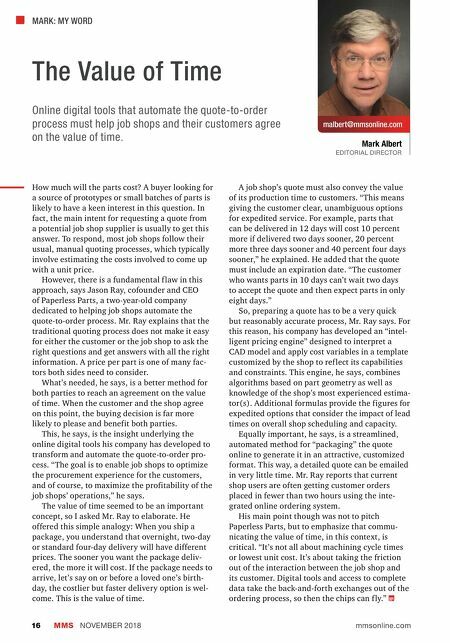 MARK: MY WORD malbert@mmsonline.com Mark Albert EDITORIAL DIRECTOR MMS NOVEMBER 2018 16 mmsonline.com The Value of Time Online digital tools that automate the quote-to-order process must help job shops and their customers agree on the value of time. How much will the parts cost? A buyer looking for a source of prototypes or small batches of parts is likely to have a keen interest in this question. In fact, the main intent for requesting a quote from a potential job shop supplier is usually to get this answer. To respond, most job shops follow their usual, manual quoting processes, which typically involve estimating the costs involved to come up with a unit price. However, there is a fundamental f law in this approach, says Jason Ray, cofounder and CEO of Paperless Parts, a two-year-old company dedicated to helping job shops automate the quote-to-order process. Mr. Ray explains that the traditional quoting process does not make it easy for either the customer or the job shop to ask the right questions and get answers with all the right information. A price per part is one of many fac- tors both sides need to consider. What's needed, he says, is a better method for both parties to reach an agreement on the value of time. When the customer and the shop agree on this point, the buying decision is far more likely to please and benefit both parties. This, he says, is the insight underlying the online digital tools his company has developed to transform and automate the quote-to-order pro- cess. "The goal is to enable job shops to optimize the procurement experience for the customers, and of course, to maximize the profitability of the job shops' operations," he says. The value of time seemed to be an important concept, so I asked Mr. Ray to elaborate. He offered this simple analogy: When you ship a package, you understand that overnight, two-day or standard four-day delivery will have different prices. The sooner you want the package deliv- ered, the more it will cost. If the package needs to arrive, let's say on or before a loved one's birth- day, the costlier but faster delivery option is wel- come. This is the value of time. A job shop's quote must also convey the value of its production time to customers. "This means giving the customer clear, unambiguous options for expedited service. For example, parts that can be delivered in 12 days will cost 10 percent more if delivered two days sooner, 20 percent more three days sooner and 40 percent four days sooner," he explained. He added that the quote must include an expiration date. "The customer who wants parts in 10 days can't wait two days to accept the quote and then expect parts in only eight days." So, preparing a quote has to be a very quick but reasonably accurate process, Mr. Ray says. For this reason, his company has developed an "intel- ligent pricing engine" designed to interpret a CAD model and apply cost variables in a template customized by the shop to ref lect its capabilities and constraints. This engine, he says, combines algorithms based on part geometry as well as knowledge of the shop's most experienced estima- tor(s). Additional formulas provide the figures for expedited options that consider the impact of lead times on overall shop scheduling and capacity. Equally important, he says, is a streamlined, automated method for "packaging" the quote online to generate it in an attractive, customized format. This way, a detailed quote can be emailed in very little time. Mr. Ray reports that current shop users are often getting customer orders placed in fewer than two hours using the inte- grated online ordering system. His main point though was not to pitch Paperless Parts, but to emphasize that commu- nicating the value of time, in this context, is critical. 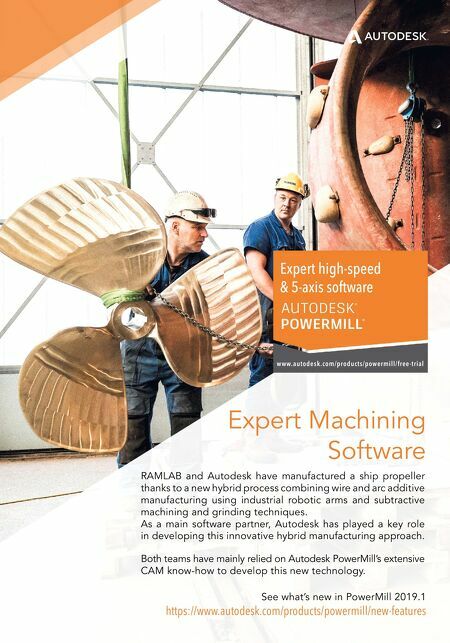 "It's not all about machining cycle times or lowest unit cost. It's about taking the friction out of the interaction between the job shop and its customer. Digital tools and access to complete data take the back-and-forth exchanges out of the ordering process, so then the chips can f ly."